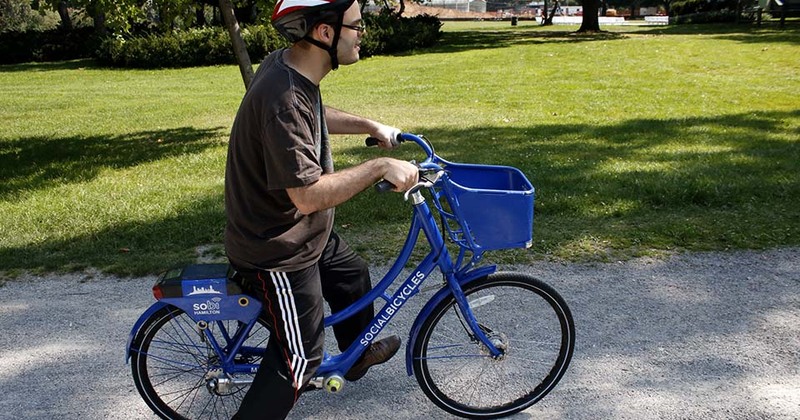 Hamilton Bike Share is the nonprofit operator of Social Bicycles (SoBi) Hamilton bike share system. Our mission is to enhance the quality of urban life in Hamilton by operating a convenient, easy-to-use bike sharing system. 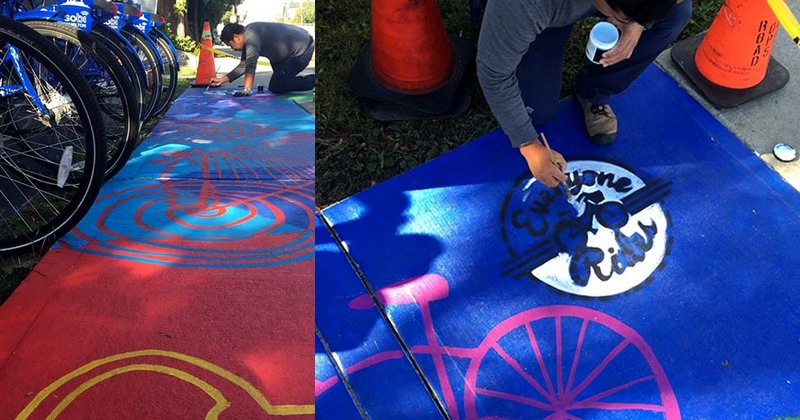 To increase the number of cyclists and therefore reduce vehicular congestion, improve air quality, and cultivate a healthier and more active community. We see bike sharing as an innovative way to improve the quality of life for residents and visitors to Hamilton. We hope to achieve this by providing residents and visitors with a healthy, affordable and sustainable way to get around the city. We envision a resilient, vibrant city where there is a greater number of maintained bike lanes and infrastructure that is safer for all road users. 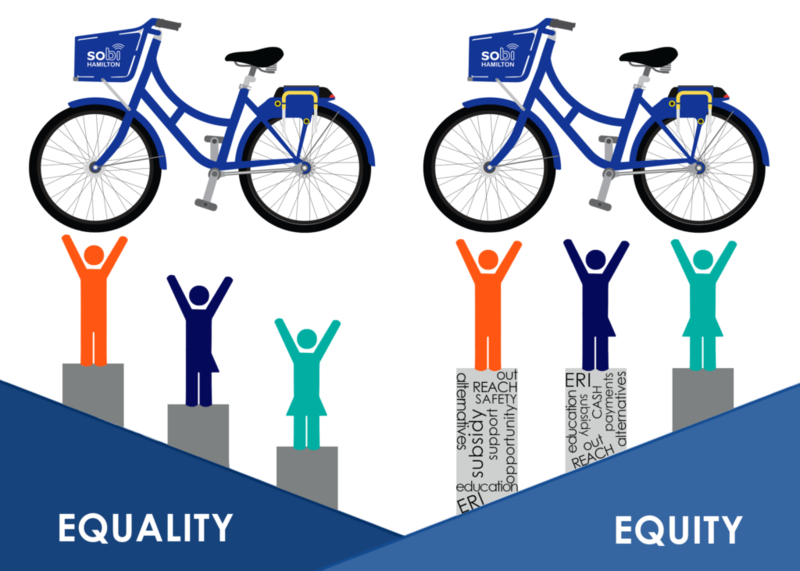 Making Hamilton Bike Share more equitable by removing the barriers that prevent people from accessing bike share. 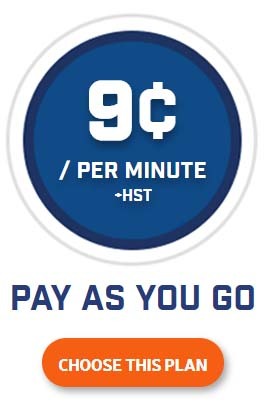 In 2015 Hamilton Bike Share received funding from Union Gas to provide service organizations in Hamilton with subsidized passes for their members and clients. 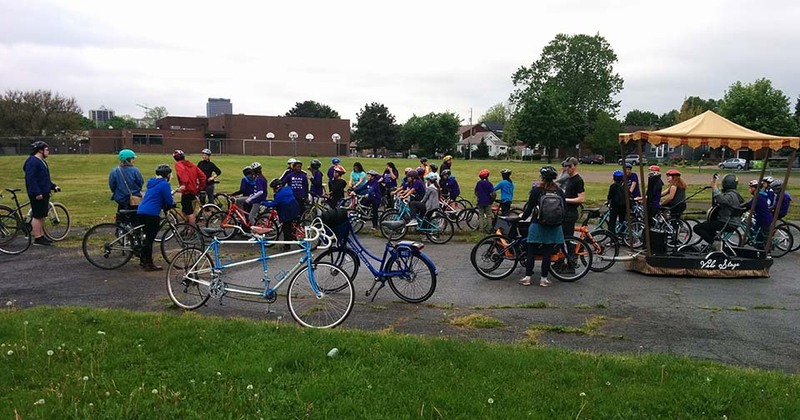 The success of this program has led us to expand the program and integrate Everyone Rides Initiatives and equity into the foundation of bike share in Hamilton. In July of 2017 we added 75 new white bikes into our system. These white bikes have 8 gears and the blue bikes which have 3 gears. 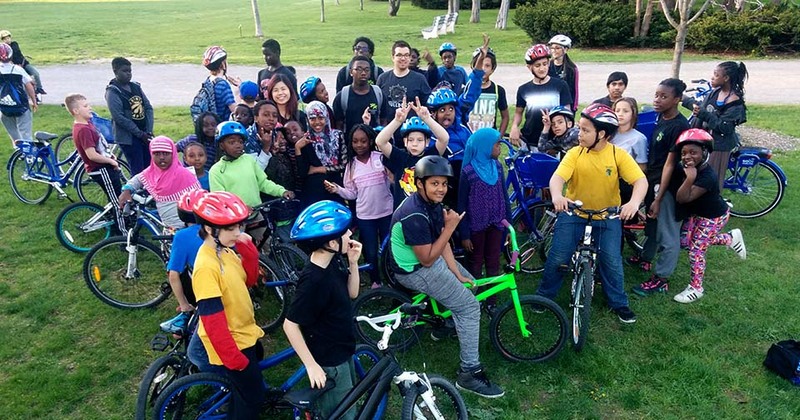 In July of 2017 we added 12 new bike hubs into key neighbourhoods. 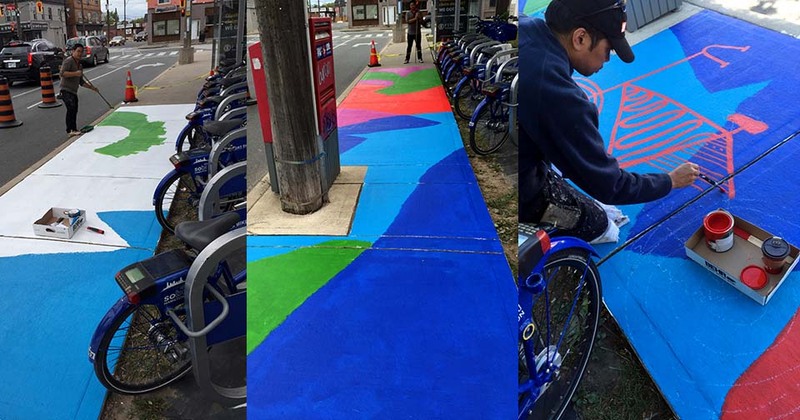 These bike hubs are located between Wentworth St and Ottawa St. 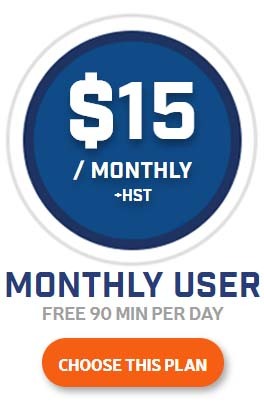 Reserved for individuals in financial need not affiliated with a service organization in Hamilton. 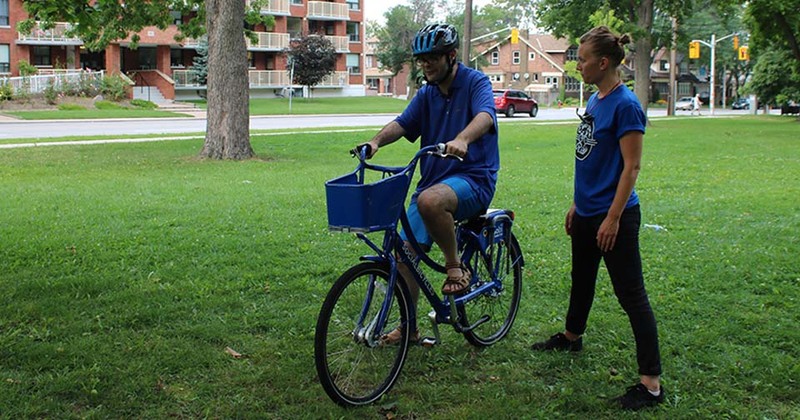 The ERI builds relationships with service organization in Hamilton to provide their members and clients with access to bikes through bike share and ERI programming. Arabic translation services are available at Hamilton Bike Share for new Canadians looking to access bike share. Meet and greet, introduction to individuals and organizations about bike share, how to obtain an account and our ERI program. Sometimes also includes a Group Ride. This is a mandatory workshop for all people access a subsidized membership. BSB covers how bike share works, the rules, Rider responsibilities, road safety and hands on bike experience. 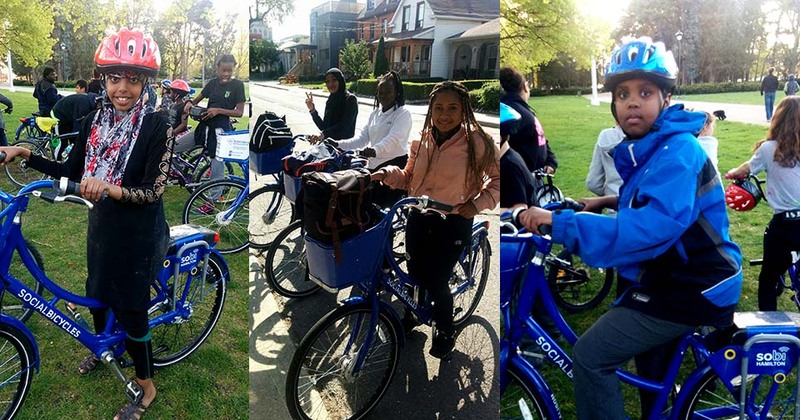 The next level to Bike Share Basics and includes more in class safety as well as road skills and a group ride, practicing our new safety skills. Geared towards new riders learning to ride or riders who need some skills to keep more confident on the road. Group Rides encourage people to explore Hamilton and gain confidence on the road with a group of fellow riders. Keep in touch with us to find out when our next group ride is. 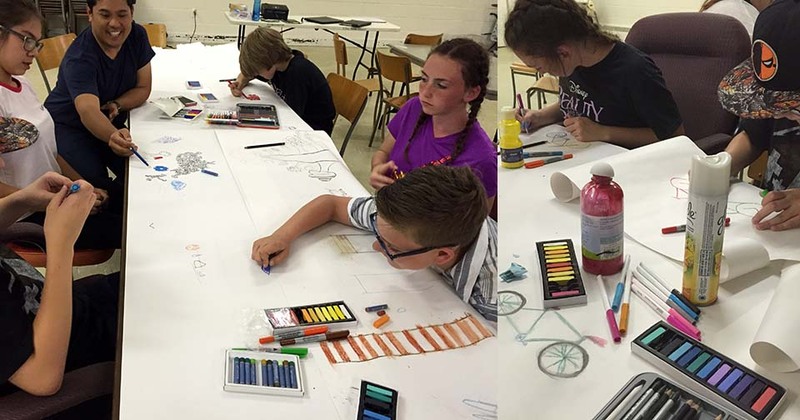 We have produced 2 sidewalk murals with Kiwanis Boys and Girls Club, L’Arche Hamilton and local mural artists Lester and Norman Coloma. 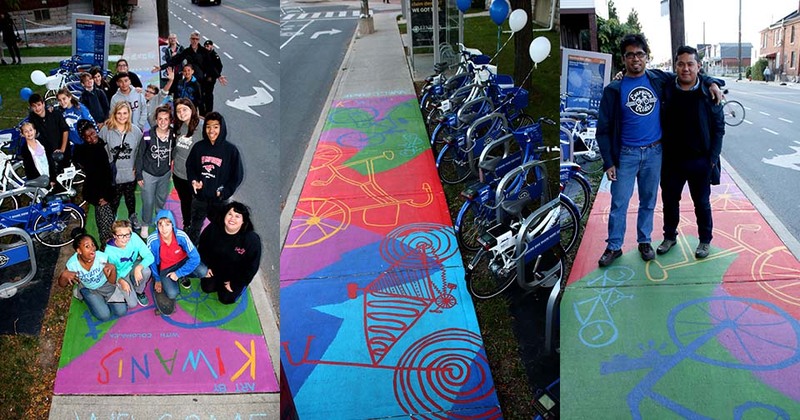 The Kiwanis mural is located at our bike hub on Cannon St at Ottawa St. 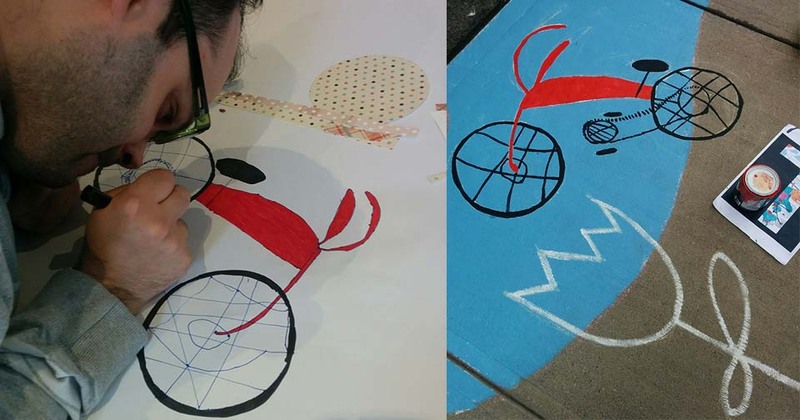 The L’Arche mural is located at 541 Barton St, next to 541 Eatery & Exchange. We regularly attend community meetings and festivals throughout Hamilton. Stop by and say Hi. Equity is providing individuals with the resources that they need in order to succeed. 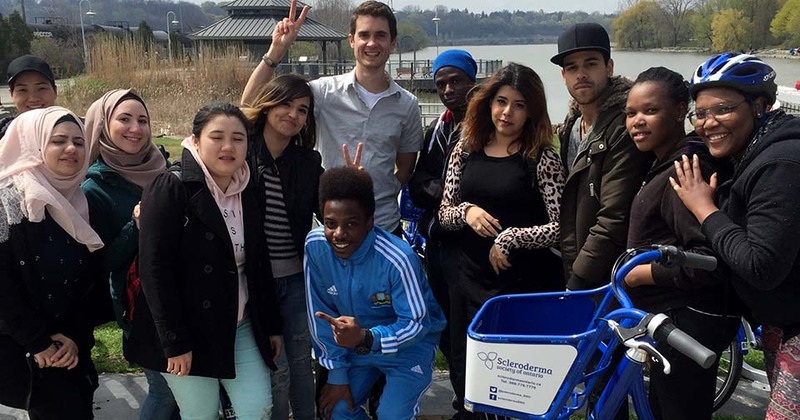 The ERI program works to ensure that we are meeting the needs of individuals who would like to access bike share and who would truly benefit from the affordable transportation and exercise. 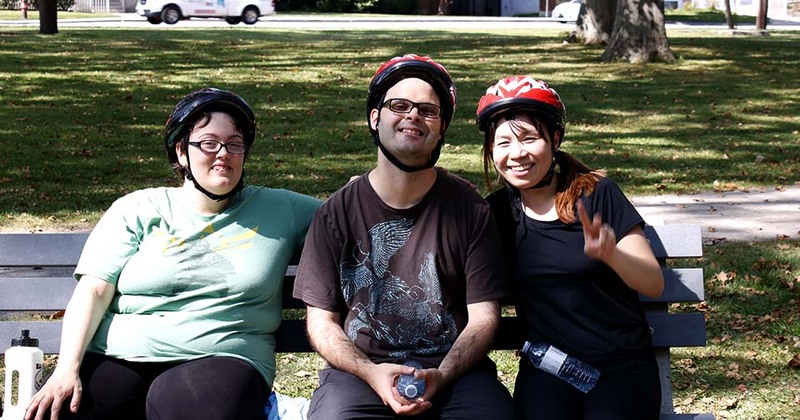 We work directly with Hamilton residents, new Canadians and service organizations to shape the ERI program to benefit the rider. 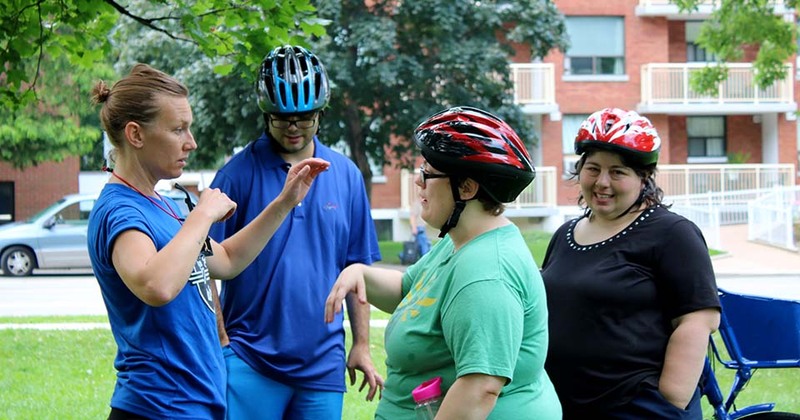 L’Arche core members Learn to ride bikes at Gage Park. Kiwanis Boys & Girls Club sidewalk mural on Cannon at Ottawa. 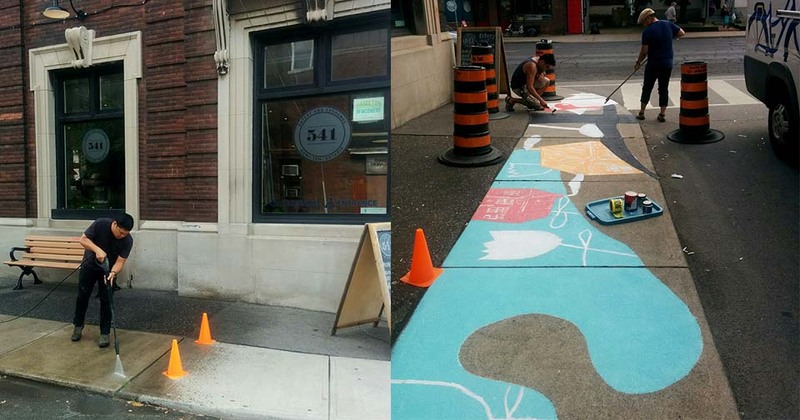 L’Arche Hamilton sidewalk mural at 541 Eatery & Exchange. 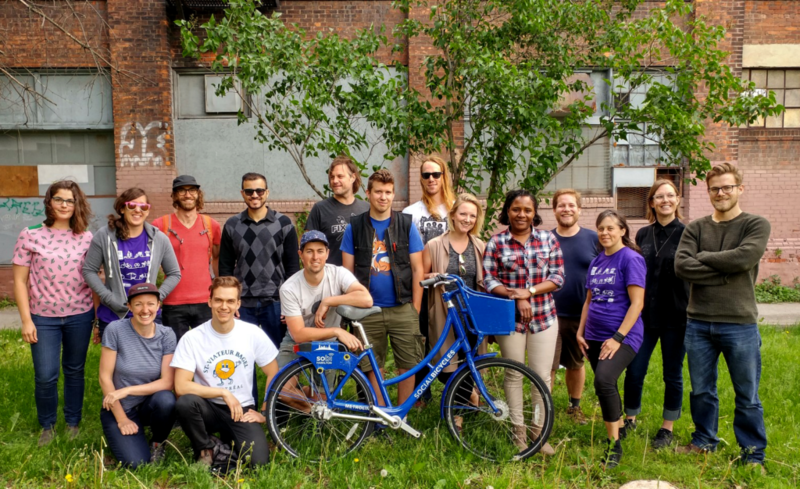 Hosting SoBi training sessions and helping community members navigate the process has enriched our sense of community through storytelling of shared biking experiences. 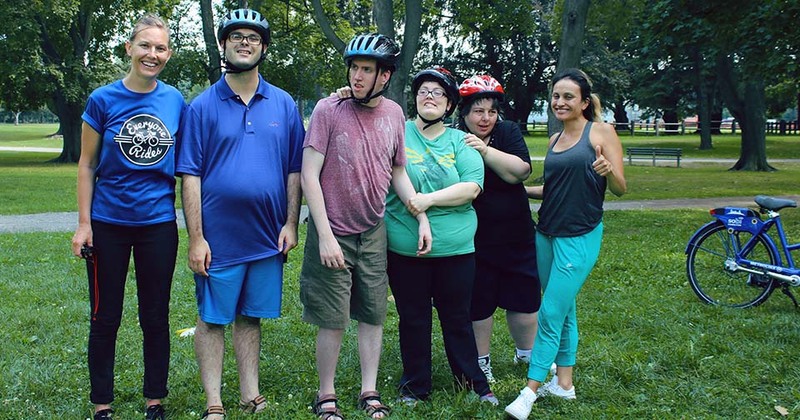 ERI helps to create a common shared experience that staff, volunteers and community members can all have together, without financial barriers that can segregate. I am more social. I get more exercise. More travel and exploration of Hamilton. I am Nooria, a 25 ­year old of student at Sir John A MacDonald. 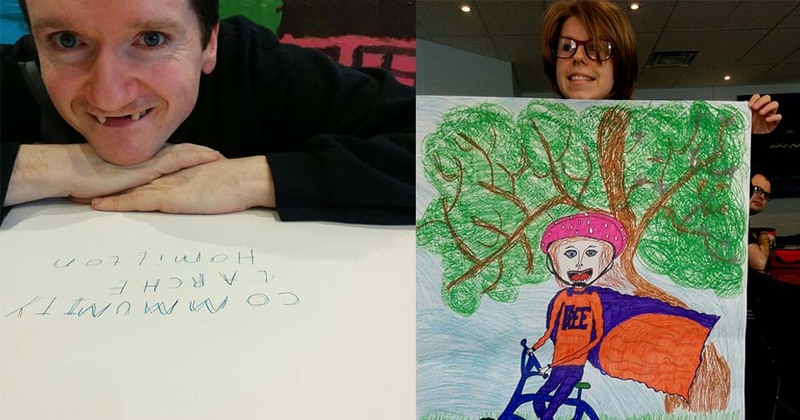 I’m writing this letter to thank you for starting the Everyone Rides project. The Everyone Rides project is a good idea for many reasons like saving money, cutting down on pollution and good for health. 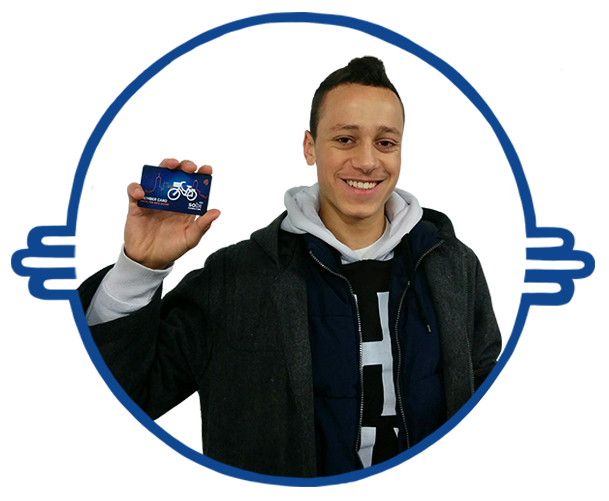 SoBi Hamilton is responsible for regular bike maintenance of our entire fleet. Riders can help us by reporting repairs on the bike or through the SoBi app when they encounter a problem. 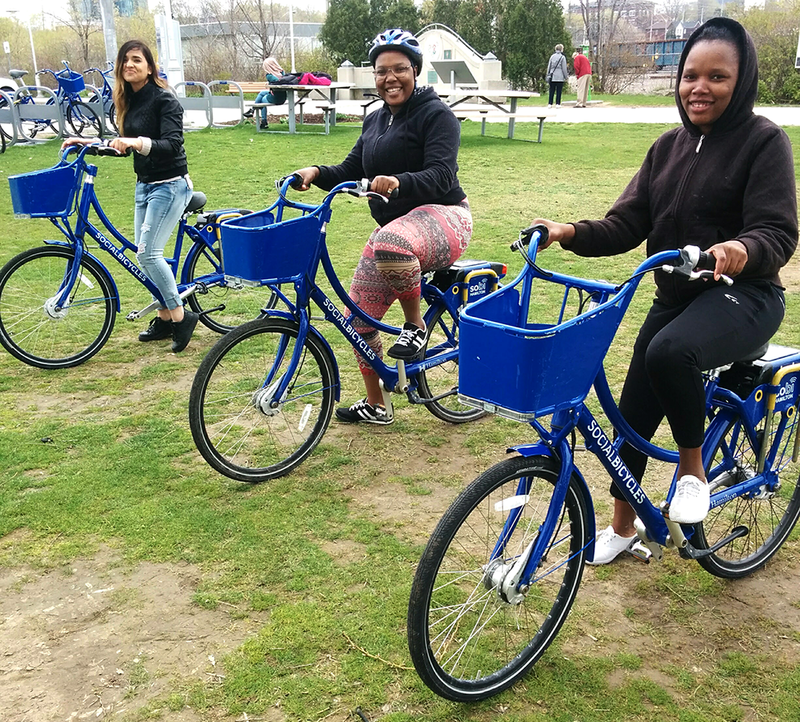 The ERI works with service organization in Hamilton to provide access to bike share for their clients, members or residents. An organization is given a set number of passes. Riders participate in a Bike Share Basics workshop, sign a registration form, complete an ERI Intro Survey. These Riders are responsible for their account and Hamilton Bike Share communicates with them directly about their usage. When a Rider moves on from this organization or is able to pay for a pass, this Tandem pass is given to another individual within the organization. 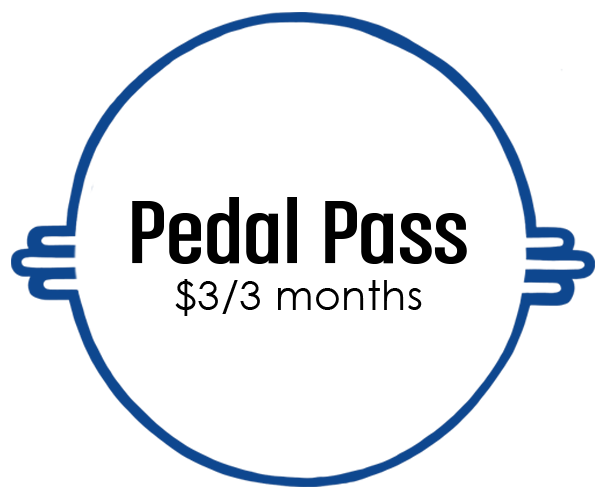 An organization is provided with a set number of passes that they can loan out to their members, clients or residents. These passes belong to the organization and are always returned after use. Staff and Riders participate in a Bike Share Basics workshop. This pass type works best for group homes or residences. An organization is provided with 1 pass that can sign out up to 10 bikes. Staff and Riders participate in a Bike Share Basics workshop. This past is best for organizations wanting to carry out active programming. Identify that you are in need. 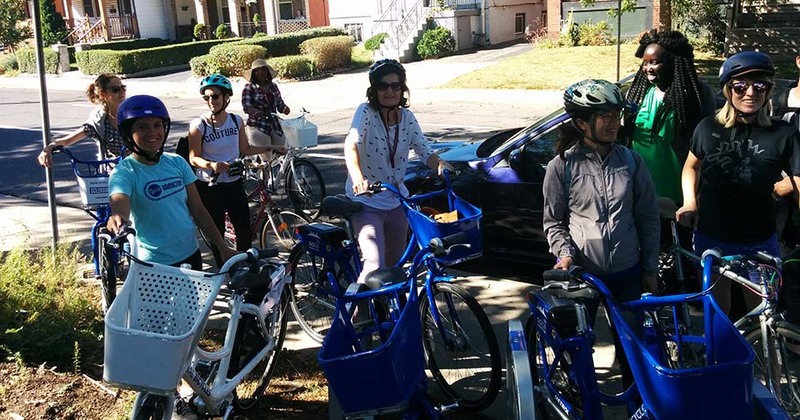 Attend a Bike Share Basics workshop. Have a telephone number or email. Pedal Passes are reserved for individuals in financial need of subsidization. There are a limited number of Pedal Passes available. Always lock your bike in a bike hub. 3 hours of ride time per day. Stay within the service area. I am now employed because I have a way of getting to work, I have been losing weight and feeling healthy. Best damn bike sharing system I’ve ever used in North America. When I was a student at McMaster, I drove a bike to and from campus every day, as well as to visit friends and go out to bars. Beats walking and taking the HSR anytime. Station density and mostly safe cycling routes in the City of Hamilton were key factors in my decision to buy a one year membership. 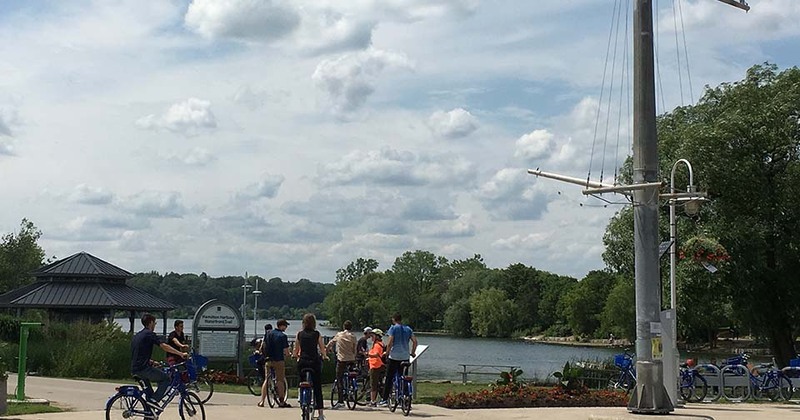 Hamilton Bike Share acknowledges the land on which we ride our bikes is the traditional territory of the Handenosaunee and Anishinaabeg. We implore all fellow settlers to learn about what it means to be a guest on this land, and to care for this land and uphold the treaties.